Today is our last day for working on Stopmotion Movies in class. As I told my students, they either get done today or they won’t get finished. This is our final full day of school, with Monday eaten up by awards ceremonies and other last-day-things-to-do that won’t allow time for playing around and creating movies on the computers. We’re in the “now or never” phase of production. A few students finished up their movies yesterday — they are short films and some are more focused than others. That’s what happens when a movie project that should be about three weeks gets crunched down to a single week. 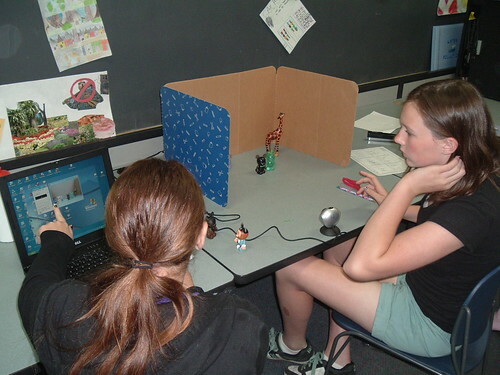 But I can say that the kids are totally engaged in the work, and they love making stopmotion movies and using our music creator software for the soundtrack. 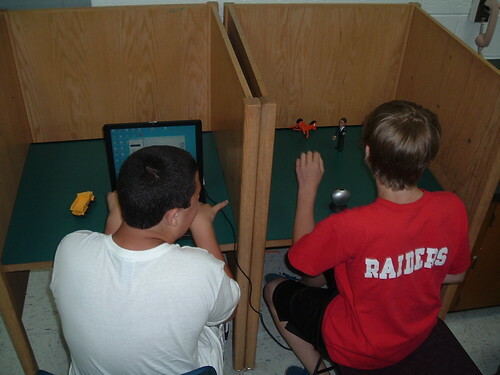 My students are in their last week, engaged in making a short stopmotion movie. Oh never mind. They can’t hear you anyway. They’re too engrossed in what they are doing. The question is: do we have time to finish? PS — I love the shot of the two boys using the study desks. There’s something about that middle dividing line between the computer and the scene that just seems to perfectly capture the small scale of stopmotion work. I experimented a bit yesterday with using the Jellycam software (which runs off Adobe Air) to create a short stopmotion movie, which I then moved up into Jaycut for editing, and then used FreeplayMusic to get a soundtrack. The results were pretty decent. And fun to do. Bored? Make a Stopmotion Movie! PS — If you want to learn more about stopmotion movies, check out my website resource Making Stopmotion Movies. This morning, as I was planning out my NWP Makes! Session a bit more for next Saturday at the National Writing Project Annual Meeting, it dawned on me that a dance party stopmotion movie is what my group should create during our hour long working time (and then, they will document what we have done with technical writing). They’ll be using clay and wikistix to create little people. And, so, I thought: I need to write a song for the video. A song about an NWP Dance Party. So, I composed it (using some music software) and wrote it and recorded it this morning, and have it now all set to go for the session. This is interesting: using stopmotion with shadow puppet techniques. I like the video itself, but I really like the “behind the scenes” video even more because it shows us how they did what they did. This is pretty neat: the world’s smallest (so they say) stopmotion movie made with a tiny microscope attachment to a mobile phone’s camera. The movie is called Dot, and there is a behind-the-scenes video of the making of the movie, too. I love when they do that. The character of Dot is just 9 millimeters tall. She’s tiny! I’ve used Animoto many times in many ways over the last few years to showcase work of my students, but I had not yet tried the ability to upload videos into Animoto, and create moving project. Our recent name movies seemed a perfect fit, since Animoto only allows for small chunks of video (I think it is about 20 seconds) which you can edit down to smaller pieces at the site itself. The process was fairly intuitive. I guess if you had a larger video, you could upload it and then duplicate it a bunch of times, editing different moments to create something a little different. Seems like a lot of work, but it could be done. I like this new theme they have at Animoto. The folding boxes seemed a nice design fit for a movie of stickfigures. Names in Motion 2010 (1) from Mr. Hodgson on Vimeo. I then grabbed finished movies (a few are still in process) and put them together into longer collections.